The clearest expression of the Holy Spirit’s work is in embracing the here and now, not clinging to the past. Those who have not kept up with the work of today, and who have become separated from the practice of today, are those who oppose and do not accept the work of the Holy Spirit. Such people defy the present work of God. Though they hold onto the light of the past, this does not mean it is possible to deny that they do not know the work of the Holy Spirit. … Those who are outside the stream of the Holy Spirit always think they are right, but in fact, God’s work in them ceased long ago, and the work of the Holy Spirit is absent from them. The work of God was long since transferred to another group of people, a group on whom He intends to complete His new work. Because those in religion are incapable of accepting God’s new work, and only hold to the old work of the past, thus God has forsaken these people, and does His new work on the people who accept this new work. These are people who cooperate in His new work, and only in this way can His management be accomplished. All those who are within the stream of the Holy Spirit are possessed of the presence and discipline of the Holy Spirit, and those who are not within the stream of the Holy Spirit are under the command of Satan, and without any of the work of the Holy Spirit. People who are in the stream of the Holy Spirit are those who accept the new work of God, the ones who cooperate in the new work of God. If those who are within this stream are incapable of cooperating, and unable to put into practice the truth required by God during this time, then they will be disciplined, and at worst will be forsaken by the Holy Spirit. Those who accept the new work of the Holy Spirit, will live within the stream of the Holy Spirit, receive the care and protection of the Holy Spirit. Those who are willing to put the truth into practice are enlightened by the Holy Spirit, and those who are unwilling to put the truth into practice are disciplined by the Holy Spirit, and may even be punished. Regardless of what kind of person they are, provided that they are within the stream of the Holy Spirit, God will take responsibility for all those who accept His new work for the sake of His name. Those who glorify His name and are willing to put His words into practice will receive His blessings; those who disobey Him and do not put His words into practice will receive His punishment. People who are in the stream of the Holy Spirit are those who accept the new work, and since they have accepted the new work, they should have the appropriate cooperation with God, and should not act as rebels who do not perform their duty. This is God’s only requirement of man. Not so for the people who do not accept the new work: They are outside the stream of the Holy Spirit.… Nothing done by those who are not within the stream of the Holy Spirit has anything to do with the new work of the Holy Spirit. Because of this, no matter what they do, they are without the discipline of the Holy Spirit, and, moreover, without the enlightenment of the Holy Spirit. For they are all people who have no love for the truth, and have been detested and rejected by the Holy Spirit. They are called evildoers because they walk in the flesh, and do whatever pleases them under the signboard of God. While God works, they are deliberately hostile to Him, and run in the opposite direction to Him. Man’s failure to cooperate with God is supremely rebellious in itself, so won’t those people who deliberately run counter to God particularly receive their just retribution? At the mention of these people’s evildoing, some people cannot help but curse them, whereas God ignores them. To man, it appears that their actions concern God’s name, but in fact, to God, they bear no relation to His name or the testimony to Him. No matter what these people do, it is unrelated to God: It is unrelated to both His name and His work today. These people humiliate themselves, and manifest Satan; they are evildoers who are hoarding for the day of wrath. Today, regardless of their actions, and provided they do not obstruct God’s management and have nothing to do with the new work of God, such people will not be subjected to the corresponding retribution, for the day of wrath has yet to arrive. There is much that people believe God should already have dealt with, and they think that those evildoers should be subject to retribution as early as possible. But because the work of God’s management has still not come to an end, and the day of wrath has yet to arrive, the unrighteous still continue to perform their unrighteous deeds. Some say, “Those in religion are without the presence or work of the Holy Spirit, and they bring shame upon God’s name; so why does God not destroy them, rather than still tolerating their defiance?” These people, who are the manifestation of Satan and who express the flesh, they are ignorant, base people, they are absurd people. They will not behold the advent of God’s wrath before they have come to understand how God does His work among man, and once they have been fully conquered, those evildoers will all receive their retribution, and not one of them will be able to escape the day of wrath. Now is not the time for man’s punishment, but the time for carrying out the work of conquest, unless there are those who impair God’s management, in which case they will be subjected to punishment based on the severity of their actions. During God’s management of mankind, all those who are within the stream of the Holy Spirit bear relation to God. Those who are detested and rejected by the Holy Spirit live under the influence of Satan, and that which they put into practice has no relationship with God. Only those who accept God’s new work, and who cooperate with God, bear relation to God, for God’s work is aimed only at those who accept it, and not all people, regardless of whether they accept it or not. The work done by God always has an object, and is not done at whim. Those who are associated with Satan are not fit to bear testimony to God, much less are they fit to cooperate with God. Of principal importance in following God is that everything should be according to the words of God today: Whether you are pursuing entry into life or the fulfillment of God’s will, everything should be centered around the words of God today. If what you commune and pursue are not centered around the words of God today, then you are a stranger to the words of God, and totally bereft of the work of the Holy Spirit. What God wants are people who follow His footsteps. No matter how wonderful and pure what you understood before is, God does not want it, and if you are unable to put aside such things, then they will be a tremendous obstacle to your entry in the future. All those who are able to follow the present light of the Holy Spirit are blessed. The people of ages past also followed the footsteps of God, yet they could not follow until today; this is the blessing of the people of the last days. Those who can follow the present work of the Holy Spirit, and who are able to follow the footsteps of God, such that they follow God wherever He leads them—these are people who are blessed by God. Those who do not follow the present work of the Holy Spirit have not entered into the work of God’s words, and no matter how much they work, or how great their suffering, or how much they run about, none of it means anything to God, and He will not commend them. Today, all those who follow the present words of God are in the stream of the Holy Spirit; those who are strangers to the words of God today are outside of the stream of the Holy Spirit, and such people are not commended by God. Service that is divorced from the present utterances of the Holy Spirit is service that is of the flesh, and of conceptions, and it is incapable of being in accordance with God’s will. If people live among religious conceptions, then they are unable to do anything that is fit for God’s will, and even though they serve God, they serve in the midst of their imagination and conceptions, and are totally incapable of serving in accordance with the will of God. Those who are unable to follow the work of the Holy Spirit do not understand the will of God, and those who do not understand the will of God cannot serve God. God wants service that is after His own heart; He does not want service that is of conceptions and the flesh. If people are incapable of following the steps of the Holy Spirit’s work, then they live amid conceptions. The service of such people interrupts and disturbs, and such service runs contrary to God. Thus those who are unable to follow the footsteps of God are incapable of serving God; those who are unable to follow the footsteps of God most certainly oppose God, and are incapable of being compatible with God. “Following the work of the Holy Spirit” means understanding the will of God today, being able to act in accordance with the present requirements of God, being able to obey and follow the God of today, and entering in accordance with the newest utterances of God. Only this is someone who follows the work of the Holy Spirit and is in the stream of the Holy Spirit. 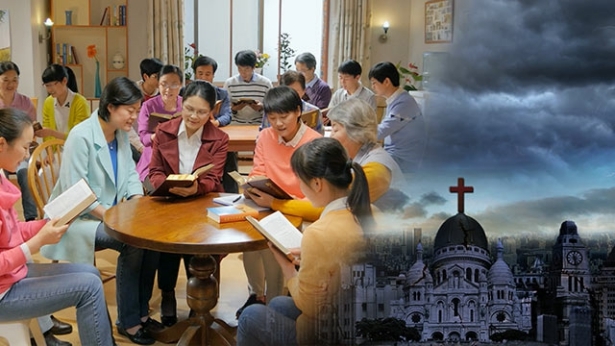 Such people are not only capable of receiving God’s praise and seeing God, but can also know God’s disposition from the latest work of God, and can know man’s conceptions and disobedience, and man’s nature and substance, from His latest work; furthermore, they are able to gradually achieve changes in their disposition during their service. Only people such as this are those who are able to gain God, and who have genuinely found the true way. Those who are eliminated by the work of the Holy Spirit are people who are incapable of following the latest work of God, and who rebel against the latest work of God. That such people openly oppose God is because God has done new work, and because the image of God is not the same as that in their conceptions—as a result of which they openly oppose God and pass judgment upon God, leading to their loathing and rejection by God. Possessing the knowledge of the latest work of God is no easy matter, but if people have a mind to obey the work of God and seek the work of God, then they will have the chance to see God, and will have the chance to gain the newest guidance of the Holy Spirit. Those who intentionally oppose the work of God cannot receive the enlightenment of the Holy Spirit or the guidance of God. Thus, whether or not people can receive the latest work of God depends on the grace of God, it depends on their pursuit, and it depends on their intentions. All who are able to obey the present utterances of the Holy Spirit are blessed. It does not matter how they used to be, or how the Holy Spirit used to work within them—those who have gained the latest work are the most blessed, and those who are unable to follow the latest work today are eliminated. Those who cannot closely follow the footsteps of God are incapable of attaining such a life. They will have lowered themselves into darkness, where they will weep and gnash their teeth; they are people who believe in God but do not follow Him, who believe in God but do not obey all of His work. Since man believes in God, he must closely follow the footsteps of God, step-by-step; he should “follow the Lamb wherever He goes.” Only these are the people who seek the true way, only they are the ones who know the work of the Holy Spirit. People who slavishly follow letters and doctrines are those who have been eliminated by the work of the Holy Spirit. In each period of time, God will begin new work, and in each period, there will be a new beginning among man. If man only abides by the truths that “Jehovah is God” and “Jesus is Christ,” which are truths that only apply to a single age, then man will never keep up with the work of the Holy Spirit, and will forever be incapable of gaining the work of the Holy Spirit. Regardless of how God works, man follows without the slightest doubt, and he follows closely. In this way, how could man be eliminated by the Holy Spirit? Regardless of what God does, as long as man is certain that it is the work of the Holy Spirit, and cooperates in the work of the Holy Spirit without any misgivings, and tries to meet the requirements of God, then how could he be punished? … Man believes that the Israelites were wrong to “only believe in Jehovah and not believe in Jesus,” yet the majority of people act out a role in which they “only believe in Jehovah and reject Jesus” and “long for the return of the Messiah, but oppose the Messiah who is called Jesus.” No wonder, then, that people still live under the domain of Satan after accepting one stage of the work of the Holy Spirit, and still do not receive God’s blessings. Is this not the result of man’s rebelliousness? Christians across the world who have not kept up with the new work of today all hold onto the belief that they are the lucky ones, that God will fulfill each of their wishes. Yet they cannot say for sure why God will take them up to the third heaven, nor are they certain about how Jesus will come to collect them riding upon a white cloud, much less can they say with absolute certainty whether Jesus will truly arrive upon a white cloud on the day that they imagine. They are all anxious, and at a loss; they themselves don’t even know whether God will take up each of them, the varied small handfuls of people, who hail from every denomination. The work that God does now, the present age, God’s will—they have no grasp of any of these, and can do nothing but count down the days on their fingers. Only those who follow the footsteps of the Lamb to the very end can gain the final blessing, whereas those “clever people,” who are unable to follow to the very end yet believe they have gained all, are incapable of witnessing the appearance of God. They all believe they are the smartest person on earth, and they cut short the continued development of God’s work for no reason at all, and seem to believe with absolute certainty that God will take them up to heaven, they who “have the utmost loyalty to God, follow God, and abide by the words of God.” Even though they have the “utmost loyalty” toward the words spoken by God, their words and actions still feel so disgusting because they oppose the work of the Holy Spirit, and commit deceit and evil. Those who do not follow to the very end, who do not keep up with the work of the Holy Spirit, and who only cleave to the old work have not only failed to achieve loyalty to God, but on the contrary, have become those who oppose God, have become those who are rejected by the new age, and who will be punished. Are there any more pitiable than them? Many even believe that all those who reject the old law and accept the new work are without conscience. These people, who only talk of “conscience,” and do not know the work of the Holy Spirit, will ultimately have their prospects cut short by their own consciences. God’s work does not abide by doctrine, and even though it is His own work, still God does not cling to it. That which should be denied is denied, that which should be eliminated is eliminated. Yet man places himself in enmity of God by holding onto but one small part of the work of God’s management. Is this not the absurdity of man? Is this not the ignorance of man? The more that people are timid and overcautious because they are afraid of not gaining God’s blessings, the more that they are incapable of gaining greater blessings, and of receiving the final blessing. Those people who slavishly abide by the law all display the utmost loyalty toward the law, and the more they display such loyalty toward the law, the more they are rebels who oppose God. For now is the Age of Kingdom and not the Age of Law, and the work of today cannot be held up against the work of the past, and the work of the past cannot be compared to the work of today. The work of God has changed, and the practice of man has also changed; it is not to hold onto the law or bear the cross. So, people’s loyalty toward the law and the cross will not gain God’s approval. Demons and evil spirits have been running amok on earth and have closed off the will and painstaking effort of God, making them impenetrable. What a mortal sin! How could God not feel anxious? How could God not feel wrathful? They cause grievous hindrance and opposition to the work of God. Too rebellious! Even those demons big and small become haughty on the strength of the more powerful devil and begin to make waves. They deliberately resist the truth despite clear awareness of it. Sons of rebellion! It is as if, now that their king of hell has ascended to the kingly throne, they become smug and treat all others with contempt. How many seek the truth and follow righteousness? They are all beasts like pigs and dogs, leading a gang of stink flies in a dung heap to wag their heads and incite disorder. They believe that their king of hell is the most superior of kings, without realizing that they are nothing more than flies on rot. Not only that, they make slanderous remarks against the existence of God by relying on their pigs and dogs of parents. The minuscule flies think their parents to be as large as a toothed whale. Do they not realize that they are diminutive, yet their parents are unclean pigs and dogs a billion times larger than themselves? Unaware of their own lowliness, they run amok on the basis of the putrid odor of those pigs and dogs and have the delusional idea to procreate future generations. That is absolutely shameless! With green wings upon their backs (this refers to their claiming to believe in God), they begin to become conceited and boast everywhere of their own beauty and attractiveness, secretly casting away their impurities onto man. And they are even smug, as if a pair of rainbow-colored wings could conceal their own impurities, and thus they persecute the existence of the true God (this refers to the inside story of the religious world). Little does man know that, though the wings of the fly are beautiful and enchanting, it is after all no more than a minuscule fly that is full of filth and covered with germs. On the strength of their pigs and dogs of parents, they run amok across the land (this refers to the religious officials who persecute God on the basis of strong support from the country betraying the true God and the truth) with overwhelming ferocity. It is as if the ghosts of the Jewish Pharisees have returned along with God to the nation of the great red dragon, back to their old nest. They have again begun their work of persecution, continuing their work spanning several thousand years. This group of degenerates is sure to perish on earth in the end! It appears that, after several millennia, the unclean spirits have become even more crafty and sly. They constantly think of ways to secretly undermine the work of God. They are wily and cunning and wish to replay in their homeland the tragedy of several thousand years ago. This almost goads God into giving out a loud cry, and He can hardly keep Himself from returning to the third heaven to annihilate them. These people who nominally believe in the true God but whom God believes to be part of a religious group—what path do they walk? Could it be said that these people walk the path of waving the flag of faith without ever following His way or worshiping Him, and instead forsaking God? That is, they walk the path of believing in God but worshiping Satan, carrying out their own management, and trying to establish their own kingdom—is this the essence of it? Do people like this have any connection to God’s management plan for the salvation of man? (No.) No matter how many people believe in God, as soon as their beliefs are defined by God as being a religion or group, then God has determined that they cannot be saved. Why do I say this? In a gang or crowd of people who are without the work and guidance of God and who do not worship Him at all, who do they worship? Who do they follow? In their hearts they acknowledge God, but in fact, they are subject to human manipulation and control. In name, they probably follow a person, but in essence, they follow Satan, the devil; they follow the forces that are hostile to God, that are enemies of God. Could God save a pack of people such as this? Are they capable of repentance? They wave the flag of faith, carrying out human enterprises, conducting their own management, and they run counter to God’s management plan for the salvation of mankind. Their final outcome is being detested and rejected by God; God could not possibly save these people, they could not possibly repent, they have already been captured by Satan—they are entirely in Satan’s hands. 1. “Incite disorder” refers to how people who are demonic run riot, obstructing and opposing the work of God. 2. “A toothed whale” is used mockingly. It is a metaphor for how flies are so small that pigs and dogs appear as big as whales to them. Previous：What is God’s church? What is a religious group? Next：Why did the Lord Jesus curse the Pharisees? What exactly was the essence of the Pharisees? How many people within religion will turn back to God in the disasters? What of some religious people who will be taken up in the middle of the disaster? They haven’t heard of the work of Almighty God, or they fail to investigate even when they know about it; they are muddle-headed. They will accept the gospel in the middle of the disaster. God says, “When I chastise the many peoples, those in the religious world will, in differing degrees, return to My kingdom.” “In differing degrees” means a number or a small proportion of them that will be taken up in the middle of the disaster.